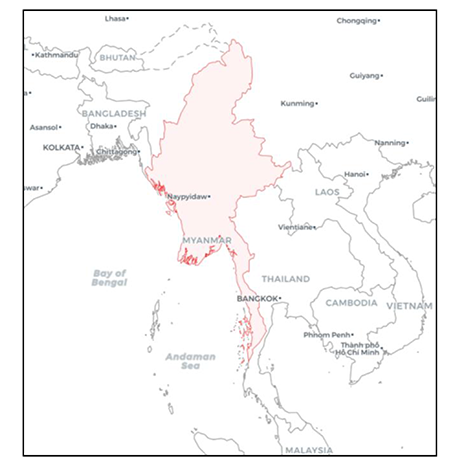 Myanmar is geographically located in Southeast Asia between latitudes 09º32’N and 28º31’N and longitudes 92º10’E and 101º11’E with a total area of 677,000 km2 (Figure 1). It stretches 936 km from east to west and 2,051 km from north to south. The country’s fishing waters including Exclusive Economic Zone (EEZ) is about 486,000 km2 and the continental shelf area is 228,781 km2. 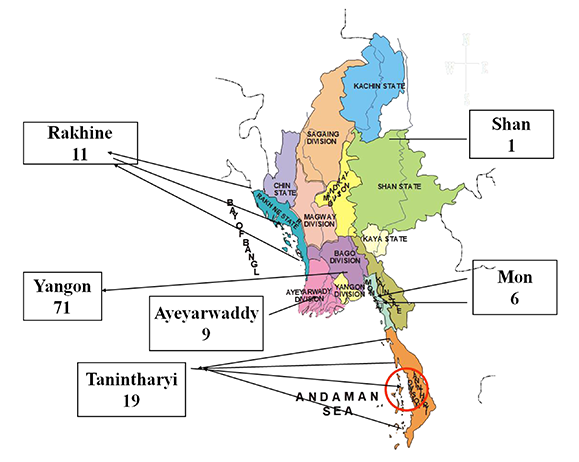 The length of its continental coastline is 2,832 km divided into three coastal regions, the Rakhine Coastal region, the Ayeyarwaddy and Gulf of Mottama (Mataban) region (the Delta Zone), and Tanintharyi region. Myanmar has extensive inland water bodies of 8.1 million ha which include natural lakes, reservoirs, river systems, and ponds. Its river system consists of the 2,000 km Ayeyarwaddy (Irrawaddy), Sittaung and Thanlwin (Salween) rivers, and 2,600 km of tributaries and smaller rivers combined. Fisheries plays a vital role in the culture and economy of Myanmar. Fish serves as major source of animal protein of its people who largely consume rice and fish in their daily meals. With population of 51.5 million in 2016, the country’s average fish consumption was 68 kg/person/year. Most of people in delta and hill regions prefer to consume freshwater fish and coastal people prefer the marine fishes. The fisheries sector is one of the major components of the country’s economy supporting thousands of households who are dependent on fisheries for their livelihoods. A total of 3,220,000 of the county’s population are employed as full time and part time fishers, where 57% are engaged in freshwater fisheries and 43% in marine fisheries (Figure 2). 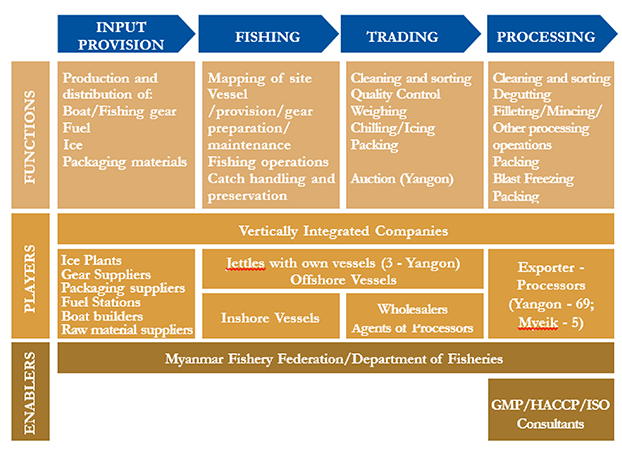 The fisheries sector of Myanmar is divided into marine and freshwater fisheries sub-sectors. 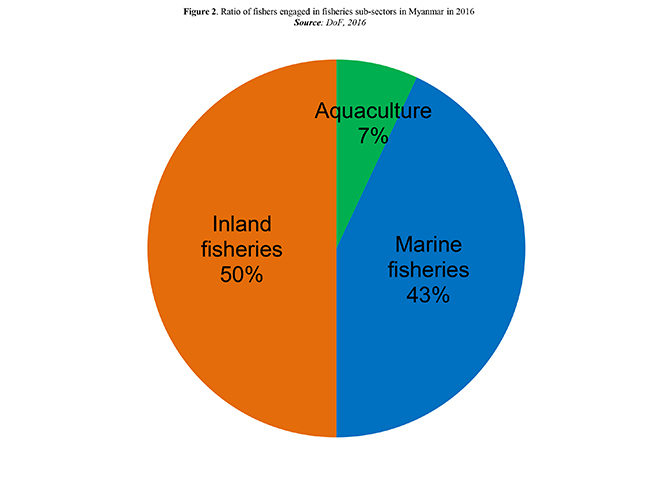 While marine fisheries sub-sector includes inshore and offshore, the freshwater fisheries sub-sector includes aquaculture, as well as leasable and open fisheries sub-sectors. 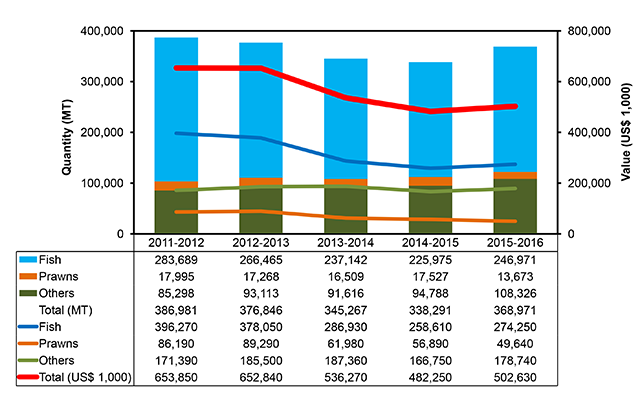 During the Fiscal Year 2015-2016, the country’s total production of fish was 5.59 million MT (Figure 3), comprising the production of marine fish at 3.00 million MT (54% of total fish production) and production of freshwater fish at 2.59 million MT (46% of total fish production). It should be noted that one fiscal year of fisheries data in Myanmar covers the period from 1 April of the current year to 31 March of the following year. In inshore fisheries, fishing boats can operate in waters 10 nautical miles from the shoreline. Inshore fishing boats are not more than 30 feet long, powered by less than 25 HP engine, and use driftnet, gillnet, and long line. On the other hand, offshore fishing vessels operate beyond the inshore fishing zone to the EEZ, are more than 30 feet long powered by more than 25 HP engine and use trawl net, purse seine, and long line. 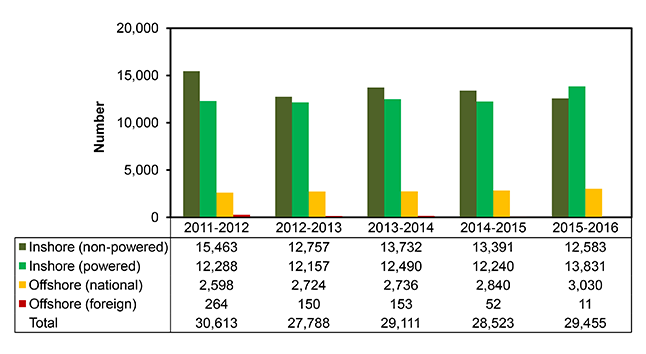 The types and number of fishing boats in Myanmar from 2011 to 2016 are shown in Figure 4. 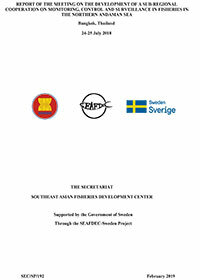 The Department of Marine Administration is responsible for the registration of fishing boats and fish carrier vessels carrying the flag of Myanmar, while the Department of Fisheries (DoF) carry out the granting, suspending, and withdrawing of fishing licences from fishing boats or carrier vessels. Also, the DoF is authorized to implement, control, and enforce laws, regulations, and conservation and management measures which must be complied with by the fishing vessels. Fishing gear registration is included in the fishing licences, where only one fishing vessel is permitted to use one unit of fishing gear. If the fishing vessel owner wants to change the fishing gear, the fisher shall apply with the DoF for permission. The specification and limitation of fishing gears and other license conditions are stated in the fishing licence card. Currently, DoF is developing its licencing system in electronic format under the e-government system. 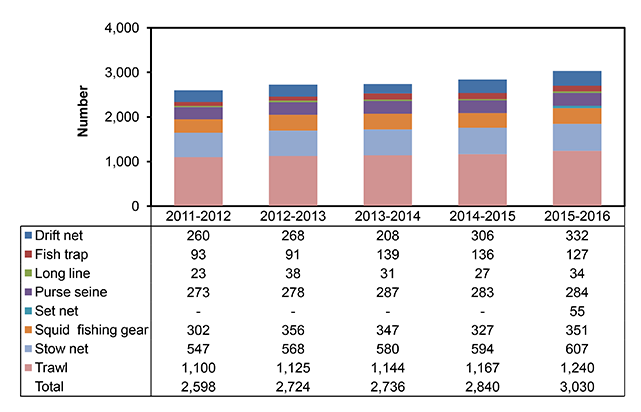 The types and number of fishing gears from 2011 to 2016 are shown in Figure 5. Freshwater fisheries production comes mostly from floodplains that cover some 6.0 million ha during 4-5 months of the year. Freshwater aquaculture is mainly operated by private sector rearing fish in pond-based culture system. The DoF is mainly providing the technical know-how of fish culture and supplying good quality fish seeds to fish farmers. For leasable freshwater fisheries, the fishing rights are granted through a lease agreement with DoF subject to stipulations relating to the area, species, fishing implements, fishing period, and methods used. Meanwhile, open fisheries is allowed in accordance with the fishing license or floating tenders issued specifying the fishing grounds and any other methods that could be used in all inland waters except in leasable fisheries. Table 1 shows the production of important freshwater fish species in Myanmar from 2011-2016. Some cold water aquatic species like Tor sp., naturally exist in the northernmost part of the country where temperature is very low. DoF has established a backyard hatchery for breeding of potentially important local indigenous fish species since 2012 and disseminating the basic fish culture technology to the local ethnic groups. The ornamental fish industry is one of the country’s main economic sectors that generate income through export. The production of ornamental fish was about 1.45 million fishes in 2014-2015 which was the same as that in 2015-2016. In terms of value, the ornamental fish production had increased to US$ 0.20 million in 2015-2016 from US$ 0.16 million in the previous fiscal year. About 70% of the fish landed in Myanmar are for direct human consumption, mostly as fresh and chilled, while some are frozen or cured, and about 10% is processed into fish meal. At present, there are 117 cold storage processing plants and factories, and 301 ice plants in the country (Figure 6). Most of the fish processing plants produced frozen raw fishery products (frozen whole fish and frozen black shrimp), although some processing establishments have been producing value-added products such as frozen, cooked, and peeled prawn, frozen crumbed prawn cutlet, frozen marinated fillet pastry, frozen marinated prawn, frozen raw prawn twister, breaded squid rings, corn twisters, breaded fish fillet finger, and breaded fish fillet square (FIQC, 2016). EU has provided technical assistance to Myanmar for the production of fishery products that are in-line with EU regulations. Currently, 20 processing establishments have obtained approval to export fishery products to EU countries. Myanmar has been exporting only frozen wild caught fishery products to EU and DoF has been making efforts to get approval for Myanmar to also export aquaculture products to EU. Moreover, the DoF has implemented the National Residue Monitoring Plan (NRMP) since fiscal year 2014-2015 with assistance from the EU. The main wholesale fish markets located in Yangon are Sanpya Fish Market, Pazuntaung Naungdan Fish Market, and Annawa Fish Market and there are also fish markets in other states and divisions. 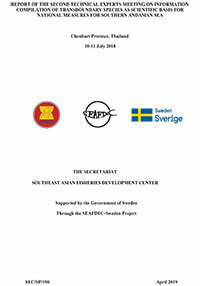 The Inspection and Certification Unit of the DoF of Myanmar makes sure that the quality and safety of fishery products are fit for human consumption by developing and applying quality and safety management systems to ensure food safety through the implementation, validation, and verification of Hazard Analysis Critical Control Point (HACCP) system and improved inspection practices that are harmonized with international inspection systems (Figure 7). The DoF of Myanmar is responsible for the monitoring, control and surveillance (MCS) activities to ensure the quality and safety of exported and imported fishery products. DoF has formed the Quality Control and Research Section with Inspection and Certification Unit and Analytical Laboratory Unit under the Research and Development Division. In 2015-2016, the amount of exported fish and fishery products was 0.37 million MT and valued at US$ 502 million (Figure 8). 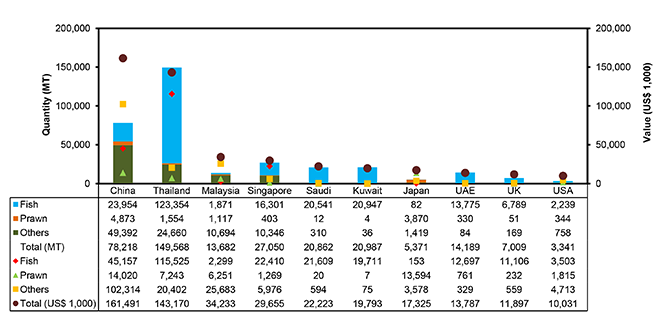 The volume and value of exported fishery products to top 10 destination countries ranked by value are shown in Figure 9. The top ten exported and imported fishery products in 2015-2016 are shown Figures 10 and 11, respectively. The sea turtle species recorded in Myanmar are loggerheads (Caretta caretta), green turtles (Chelonia mydas), hawksbills (Eretmochelys imbricata), olive ridleys (Lepidochelys olivacea), and leatherbacks (Dermochelys coriacea). DoF has sighted at least 35 nesting sites along the country’s coastal region, seven of which are closely conserved by undertaking monitoring and surveillance of turtle landing sites, clutches and magnitude of hatchlings that are able to return to the sea. Since September 2001, the country has been conducting turtle conservation activities in collaboration with international agencies and organizations. The Memorandum of Understanding on “Conservation and Management of the Marine Turtle and their Habitats of Indian Ocean and Southeast Asia (IOSEA)” was signed by DoF Myanmar. At present, Myanmar cooperates and collaborates with ASEAN-SEAFDEC, IOSEA, and Indian Ocean Turtle Newsletter (IOTN) for the conservation ang management of sea turtles. The 19th century naturalist John Anderson described the Irrawaddy dolphin in the Ayeyarwaddy River as morphologically distinct from other Orcaella brevirostris. DoF established a 72-km protected area for the Irrawaddy dolphin in a segment of the Ayeyarwady River between Min Gun in Mandalay Region and Kyauk Myaung in Sagaing Region. 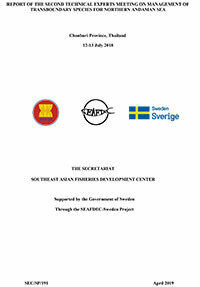 Despite much effort by the Government of Myanmar to promote gender equity including the establishment of a National Committee for Women Affairs (NCWA), there is no information on the budget allocated for gender mainstreaming across Ministries including in the Fisheries, Livestock and Rural Development Ministry (Johnstone et al., 2012). Similarly, there is very limited information and data on the role of men and women in the fisheries sectors of Myanmar that can be applied to develop the appropriate policies. A number of policies on gender established by a number of international conventions that ensure women’s equality, had been signed by the Myanmar Government, such as the 1997 Convention on the Elimination of Discrimination against Women, the Millennium Development Goals, the Beijing Declaration and Platform for Action, and the International Conference on Population and Development (ICPD). 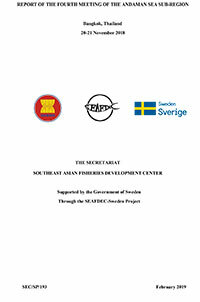 Myanmar is also an active member of the Association of Southeast Asian Nations Committee on Women and Children. In the DoF organizational structure, there are neither personnel, department, or division responsible for gender-related works in the fisheries sector. This is mirrored at the village level where women representation in the leadership of villages at village tracks and wards is almost nil at only 0.2% (UNDP, 2015). With the absence of devoting human resources and budget, it is unlikely to actively mainstream gender issues into different levels of the country’s fisheries sector. DoF. 2016. 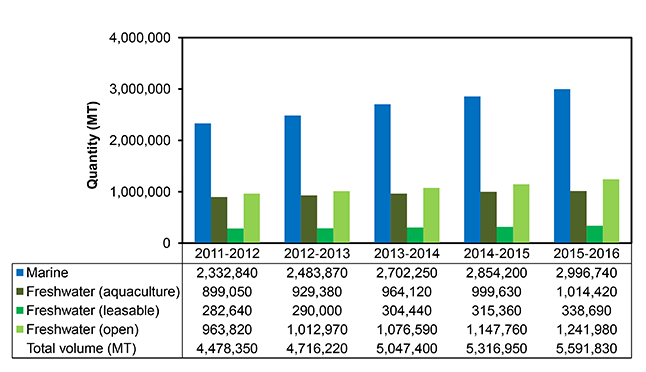 Myanmar Fisheries Statistics. Department of Fisheries, Ministry of Agriculture, Livestock and Irrigation. FIQC. 2016. Fish Inspection and Quality Control Section, Department of Fisheries, Ministry of Agriculture, Livestock and Irrigation. FAOSTAT. 2018. Statistics Division, Food and Agriculture Organization of the United Nations. 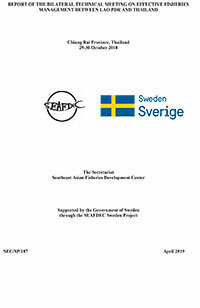 Available at http://www.fao.org/faostat/en/#country/28. Accessed on 28 May 2018. ILO. 2015. Sustainable Management of the Bay of Bengal Large Marine Ecosystem. International Labor Organization. Johnstone, G., Puskur, R., Pant, J., Phillips, M., Gregory, R., Baran, E., Kura, M. S., Andrew, N., Grunbuhel, C., Nilar, S., Nyunt, W., and Saw, A. H. L. 2012. Ayeyarwady Delta Scoping Report. MYFish. 24-29 November 2012. UNDP. 2015. Women and local leadership: Leadership journeys of Myanmar’s female village tract/ward administrators.